This resource contains the traditional Thayer definitions of Greek words, arranged by Strong's numbers. All of the original Greek words are arranged by the numbering system from Strong’s Exhaustive Concordance of the Bible. The Strong’s numbering system arranges most Greek words by their alphabetical order. This renders reference easy without recourse to the Greek characters. In some cases more than one form of the word - such as the masculine, feminine, and neuter forms of a noun - may be listed. Immediately after each word is given its exact equivalent in English letters, according to the system of transliteration laid down in the scheme here following. Next follows the Thayer’s Definitions given in English. Then ensues a reference to the same word as found in the ten-volume Theological Dictionary of the New Testament (TDNT), edited by Gerhard Kittel. Both volume and page numbers cite where the word may be found. 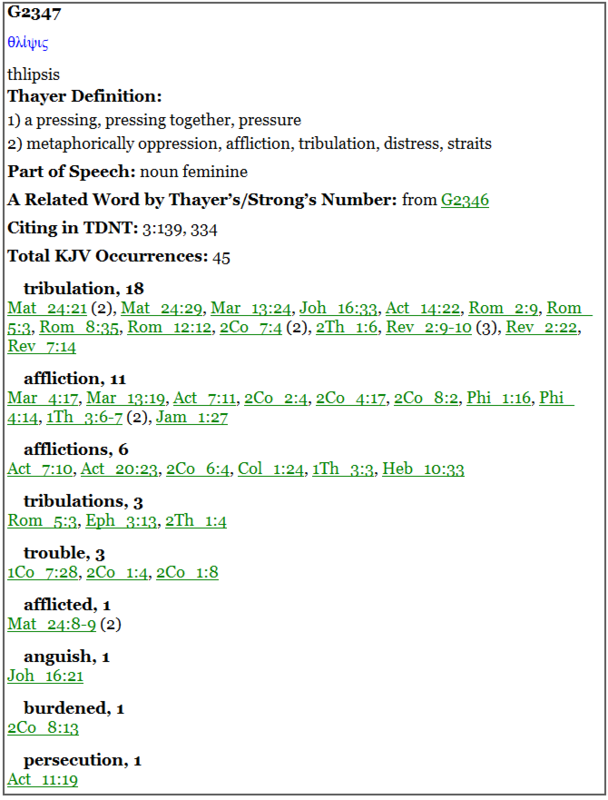 The presence of an asterisk indicates that the corresponding entry in the Theological Dictionary of the New Testament may appear in a different form than that displayed in Thayers’ Greek Definitions. NOTE: Owing to changes in the enumeration while in progress, there were no words left for Nos. 2717 and 3203-3302, which were therefore silently dropped out of the vocabulary and references as redundant.